Sorry, friends, sorry for falling off the face of the earth for the past week and infrequently posting and all that. Three research papers, only two of which I was proud of handing in (if I can revise that third one, I will). And not much eating, to be frank. I've been very reclusive, shuffling between my apartment and the library. But when the urge to come to have a bite and have it not be pizza or delivered Chinese, I did stop by a few joints. The same night I headed to Big Gay Ice Cream's new shop, Donny and I walked over to Porsena for some dinner. 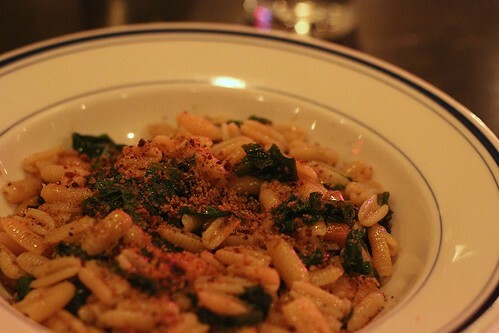 Everything on the menu seems delicious, but I finally went for the Gnocchetti con le pulezze: gnocchetti with mustard greens, garlic, anchovy, chili, and breadcrumbs. I've recently been sauteing breadcrumbs before adding them to pasta, so it was exciting to see this happening at a restaurant. And I loved this plate of pasta! You don't usually see spicy Italian pasta and it was refreshing, in a way, having a new take on a known dish. Similar to having savory ice cream. For a pricey $18 a bowl, it better be plate-licking delicious. I found myself down at the South Street Seaport within the past few days, only to see that almost every shop there is still closed. 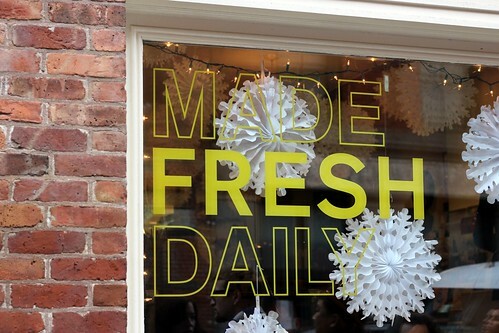 Except for Made Fresh Daily! There you find great Porto Rico coffee, an airy shop with plenty of seats, and delicious sandwiches. I got a huge slice of a frittata that came with a significant salad and hunk of focaccia, and it kept me going until late in the evening. If you find yourself down there looking for a bite, head here! I'm going to go rest my wrists now.